Snaps, no. 48: Hilliard S. “Dock” Cotton. The grocery at Carroll and Carolina Streets is on the southwest corner — 1114 Carolina Street. In the 1930 census of Black Creek township, Wilson County: Henry Cotten, 44; wife Lula, 37; and children Hilliard, 15, and Ardelia, 14; all farm laborers. In 1940, Hilliard Sander Cotton registered for the World War II draft in Wilson County. Per his registration card, he was born 17 August 1914 in Black Creek, N.C.; lived at 27 Carolina Street; worked for Wilson Veneer Company; and was married to Phoebe Cotton. 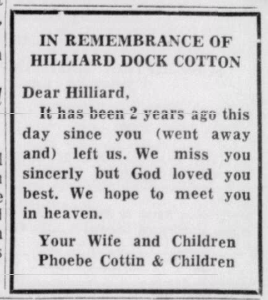 Hilliard (Dock) Cotton died 23 April 1963 at Mercy Hospital. Per his death certificate, he was born 17 August 1914 in Wilson County to William H. Cotton and Clara Cotton; was married to Phoebe Cotten; lived at 1216 Carolina Street; worked as a clipper operator/laborer; was buried in Jones Hill cemetery. Wilson Daily Times, 23 April 1965. Rev. Phoebe Ann Britton Cotton died 15 December 1971 in Wilson. Per her death certificate, she was born 28 February 1916 in South Carolina to Waitis Barnwell Britton and Emma Britton; was a widow; resided at 1303 Carolina Street; and was a minister. John Cotton of Augusta, Georgia, was informant. She was buried in Jones Hill cemetery. 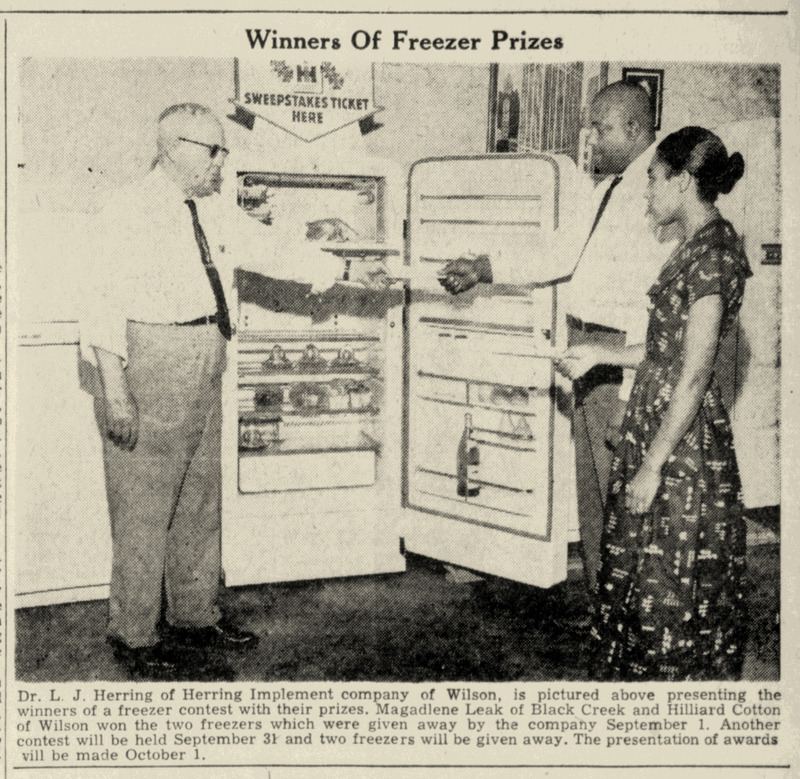 Wilson Daily Times, 10 September 1955. This undated photograph is found in a scrapbook belonging to the Oliver Nestus Freeman family. Brown’s Service Station stood at 1216 East Nash Street. Containing a small grocery, it was an early precursor to today’s convenience store. Per a label, Nestus Freeman is one of the men depicted; my guess is the man at left holding the gasoline pump nozzle. Note the Coca-Cola and Texaco advertising. 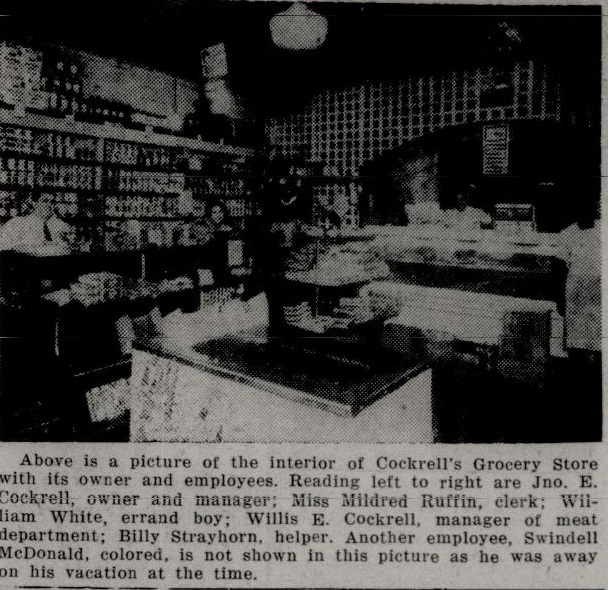 Entry under “Grocers–Retail” in the 1925 Hill’s Wilson, N.C., City Directory. Freeman’s album is among the documents digitized by DigitalNC.org in the Oliver Nestus Freeman Round House Museum Group of the Images of North Carolina Collection. News & Observer (Raleigh, N.C.), 26 September 1909. 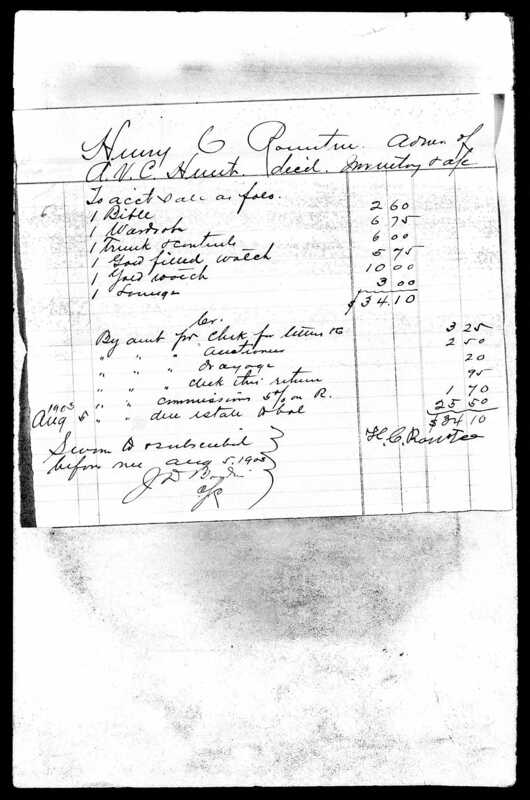 Walston Tucker — This appears to be a reference to Jacob Tucker, who ran a nearby grocery. In the 1900 census of Wilson, Wilson County: day laborer Jacob Tucker, 40, wife Mary, 39, and children Doward, 17, Daniel, 15, Thomas, 13, Henry, 12 (all day laborers), Smart, 9, Walter, 7, Patience, 5, Joseph, 2, and Bessie, 11 months. In the 1910 census of Wilson, Wilson County: on Spring Street, retail grocer Jake Tucker, 45, wife Jane, 45, and children Andrew, 19, a factory laborer, Walter, 15, a bootblack at a barbershop, Pet, 13, Joe, 12, Bessie, 10, and Viola, 7. 1910 census of Toisnot township, Wilson County. This photograph depicts the interior of Graham W. Batts’ grocery at 418 South Goldsboro Street. Batts is standing at right. The unidentified African-American man and woman at rear likely were employees. The west side of the entire 400 block of South Goldsboro Street — between Jones and Hines Streets — has been demolished. 418 stood in what is now the grassy side parcel of a Family Dollar store. Photograph courtesy of Keith Thomas. Many thanks for sharing. Wilson Daily Times, 16 August 1946. 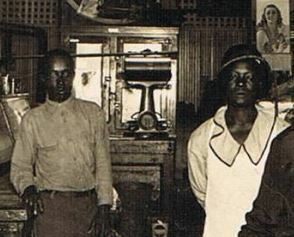 Cockrell’s Grocery, at the corner of Green and Pettigrew Streets one block east of the railroad, served a largely African-American clientele. The building at 404 East Green now houses Saint Mary’s Love and Faith church, a Holiness congregation. Billy Strayhorn and Swindell McDonald, despite their length of service, were teenagers at the time this article was printed. I cannot identify William White with certainty. 404 East Green Street, courtesy Google Maps. Be convinced by the first colored merchant uptown. The Great Sunny South (Snow Hill NC), 15 April 1898. 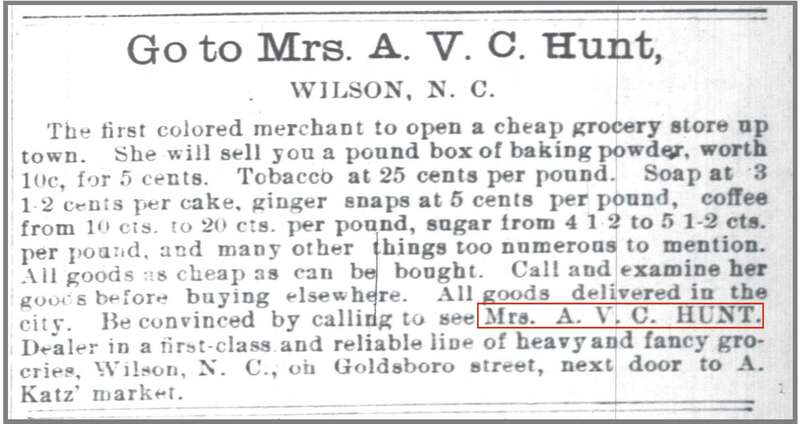 [I am greatly intrigued by the ground-breaking Mrs. A.V.C. Hunt, but have found little beyond some titillating, but enigmatic, coverage of an arson event involving her and/or her husband, the unnamed Mr. Hunt. Wilmington Messenger, 29 March 1899. Wilson Daily Times, 31 March 1899. 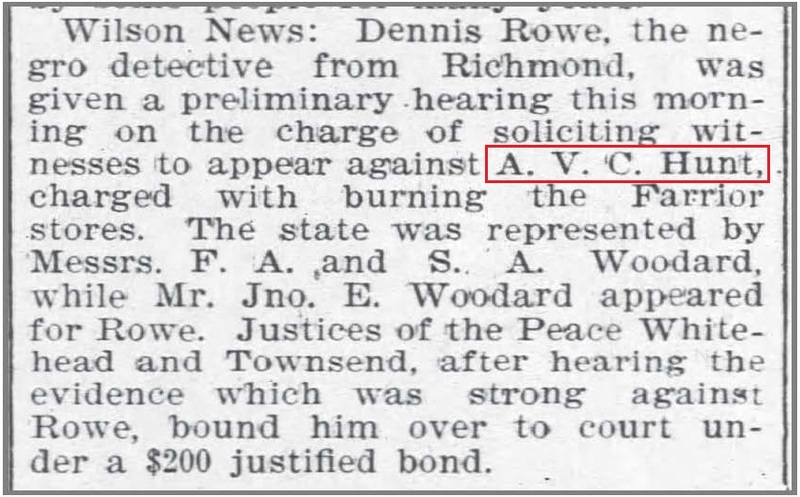 Justice apparently was available in Wilson criminal court as Hunt was acquitted of arson (though found guilty and fined for the assault on Rowe. Wilson Times, 30 June 1899. Image from file of A.V.C. Hunt, North Carolina Wills and Probate Records, 1665-1998, ancestry.com.